Replace contact points and condensor by solid-state electronics! 4/6-cilinder: Alfa, Audi, BMW, Ford, Mercedes, Opel, Porsche, Saab, VW, Volvo/Penta and others. 4/6/8-cilinder: Austin, BMC, Leyland, Lotus, MG, Wolseley, Reliant, Rover, Triumph and others. 4-cilinder: Citroën, Peugeot and Renault and others. 4/6-cilinder: Chevrolet, Datsun, Dodge, Ford, Honda, Hyundai, Mazda, Nissan, Subaru and others. 4/6-cilinder: Toyota, Toyota Industrial, Nippondenso and others. 8-cilinder: Mallory distributors in many applications. 4/6-cilinder: Chevrolet, Allis Chalmers, International, John Deere, Mercruiser and many others. 4/6/8-cilinder: Autolite, Chrysler, EchlinFord, International, FoMoCo, Ford, Mercury and Motorcraft. 4/6-cilinder: Case, Chrysler, Continental, IH, John Deere, Massey Ferguson, New Holland and others. 6/8-cilinder: Chevrolet, Chrysler, Crusader, Ford, MPS, Mercruiser, OMC, Volvo-Penta and others. 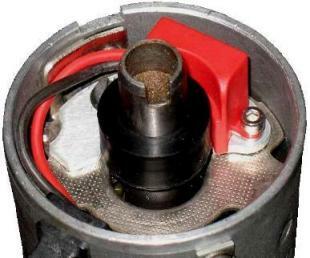 Although your engine might be very powerfull, without a good ignition one cannot use it's potential to the maximum. The Hot-Spark electronic ignition-kits replace your old contact breaker points and condensor with a solid-state, durable and affordable electronic ignition. The Hot-Spark kits use the very reliable Hall-technology. There are no moving parts and no parts that wear out. Hot-Spark kits therefor have zero wear, no point float, amd no bad breaker contacts or condensor. The electronics are all cast in a thermoplastic housing and is fully protected agains heat, oil, dirt and moist. After installing the Hot-Spark ignition kit (which is as easy as replacing contact points) you will never have to do any maintainance to these parts, never have to check timing or dwell, etc. The Hot-Spark ignitions will give you endless maintainance free miles. - Replace contact points and condensor with solid-state electronics. - Adaptive dwell control: always the right charge for the coil. - Set and forget. Never adjust points or timing again! - Zero wear. Zero maintenance. - Very durable and reliable. Dwell and timing are allways spot on. - No point float at (very) high rpm. - Sends higher voltage to spark plugs. - Stronger spark: easier starting, nicer idle, more power, higher milage. - Original look: Fits completely in stock distributor. - Full 3 year replacement warranty!